Home › News › What the Puck? Why did you build the Puck? Why not incorporate the functionality of the Pucks into the Smart Vents? When we first started Flair, we did a lot of testing on whether we could correctly identify room conditions—temperature, humidity, pressure, and occupancy—using the Smart Vent. Our experiments confirmed what we believed all along. Despite what a competitor claims, it is not possible to reliably measure room conditions from vents. For example, placing the temperature sensor in a vent is probably one of the worst places to put it. It results in very skewed temperature readings because you're measuring the temperature right next to a hot or cold airflow. Nothing is more frustrating than having a smart HVAC system that can't tell the correct temperature! 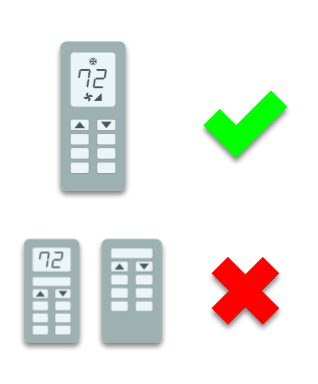 As a result, we decided to make a best-in-class wireless thermostat to work alongside our Smart Vents. It can measure a number of room conditions (temperature, pressure, humidity, and ambient light). It can control any heating/cooling device with an IR remote control, including portable ACs, Window ACs, mini splits. That last point was very important to us. Mini split (ductless) units and window ACs are the world's most popular air conditioner. Smart thermostats like Nest and ecobee can't work with them, but we wanted to make a wireless thermostat that works with most every kind of heating or cooling system. Mini splits are also one of the most popular air conditioning upgrades. Even if you don't have one now, you might upgrade to one or put one into a garage or room addition. The Puck was designed for what customers wanted. In this case, it meant not only making the Puck control our Smart Vents, but also designing a smart thermostat for the future. The result was a product that is simple to use, beautifully designed, and adaptive to a lot of users' home environments. And, of course, it measures the accurate temperature for your Smart Vents too. Want to ask us a question? Head over to our Contact Us page, post a question on the Flair Forum, or use the help button below.